A great gift for the coffee or tea drinker on your list is a personalized mug. This is a guide about making personalized mugs. Tired of the same generic gift you give (and receive)? Here's an inexpensive yet personalized and classy gift you can give this Christmas! But first, you need to visit your local thrift shop for mugs at 25-50 cents each! (Buy them at your local thrift shop. Or if you want brand new, you can buy them also at the Dollar Store). Matte finish mugs have better adhesion than glazed mugs. Line your working area with newspaper or any paper that will protect it from the paint. Wash and dry mugs to make sure you have a clean surface, devoid of dust which prevents good adhesion. Plan which mug (color and design) goes to which person. Label papers with the names and tape them on the inside of the mug. Plan how you want to design the mug. In this example, the recipients' are a husband and a wife. So, their names are written in a font that is similar to each other. Also, the design of the mugs are similar. Using the textile paint's thin opening, implement the plan. Let the paint dry. Caution on the textile paint: Sometimes as your are dispensing the textile paint, trapped air in the container burst on the mug surface disturbing your design. To prevent this, be careful when squeezing the textile paint container. If the unpreventable happens, immediately wipe the excess textile paint using tissue paper. Once the textile paint dries up (approximately 2-3 hours in summer, 1 day in winter), apply a thin coat of colorless nail polish. Let the paint dry. The nail polish is for protection from washing - both by hand or by machine. Washing the glazed mugs in hot cycle will typically remove the paint. Matte-finished mugs are more resistant during dishwashing. Add the ribbon and a gift tag. Now, this does not necessarily have to be a gift. If your household is like mine where the other members of the family use many, many glasses in one day, you can make them their personal mugs so that they can rinse them after every use and reuse them within the day! That way, only 1 glass (or mug in this case) is used by 1 person in each day! 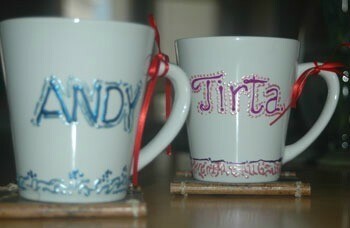 I made personalized cups one year for Christmas presents. I gave to my friends . .I also put hot chocolate in some Flavored hot teas or other drink mixes that are heated. I also made small pound cakes or fresh apple cake enough for two and gave with each present my friends loved it .Ps you can buy throw away cake pans at the grocery store. You can also freeze most cakes you bake ahead . If not a baker buy some Bakery cookies, homemade candies or store bought candies and give with a coffee mug. these are very pretty..but what is the name on the pink mug??? just curious! !